In this expansion for Fighting Formations, we feature the Grossdeutschland Division as it fought in 1943 around the Ukrainian city of Kharkov and early 1944 to the west of the city. 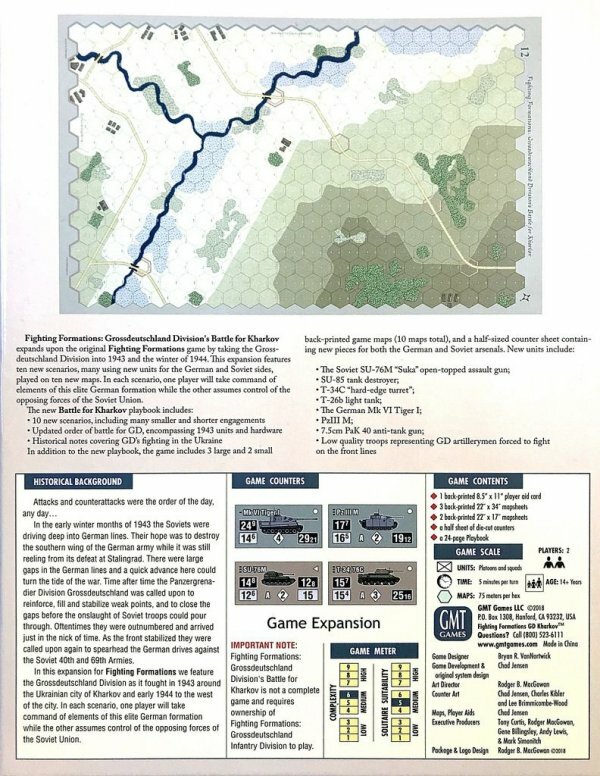 In each scenario, one player will take command of elements of this elite German formation while the other assumes control of the opposing forces of the Soviet Union. 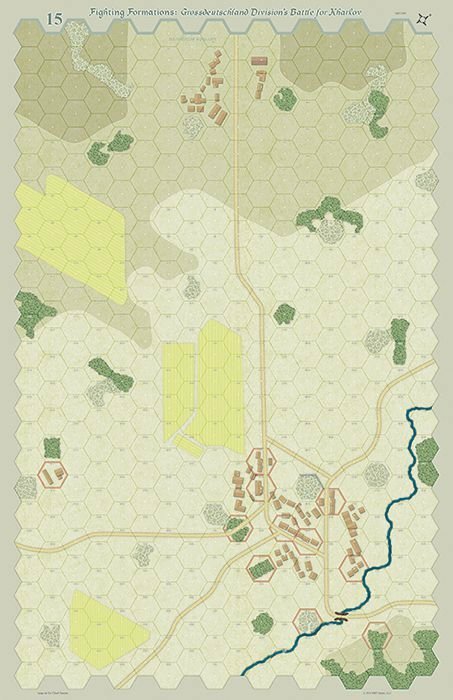 · Cut Off—Units of the Grossdeutschland Regiment find themselves surrounded by advancing Soviet forces on the highway leading north to Belgorod on 11 February 1943. 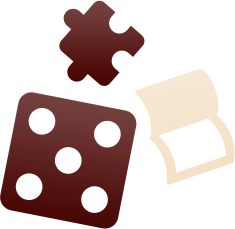 · Who’s Who—On 4 November 1943 near Krasny Orlik, Major Frantz, the Assault Gun Battalion commander, became quite wary when he heard the sounds of combat to his north. This northern flank was to be held by 9th Panzer. However, nothing could be seen over the high rail line that divided their two sections of the front. Were they still there and holding the line? Major Frantz decided to investigate the situation for himself and crossed the rail line with another assault gun. As he watched German troops and guns stream by in retreat he found himself in the midst of a tall cornfield with Russian T-34s streaming by at a range of 20 yards. They were faster than he was, and were by him in an instant…. · Duel—General Koniev's 2nd Ukrainian Front launched a major offensive in December of 1943, with the aim to break through the German lines in the Kirovograd area. Multiple attacks were launched and Soviet troops were pouring through. The Panzergrenadier Grossdeutschland Division was brought up to close the gaps and help create a continuous defensive line. There was a critically vulnerable point along the road to the east of the village of Anniska. Here II Battalion, Panzergrenadier Regiment GD was struggling to hold its position. They were reinforced by the anti-aircraft troops of GD's Army FlaK Battalion just in the nick of time. · Welcome to Kharkov—21 January 1943: Reports from the Soviet Voronezh Front were that they had broken through the Hungarian army's positions and were advancing into the Novy Oskol area northwest of Kharkov. The Oskol river was being breached and preparations were in progress for further attacks towards Belgorod and Kharkov. General Kazakov's 69th Army was to attack southeast taking Volchansk and then on into Kharkov. Before the city, however, lay Volokonovka, which would provide an opportunity to hit the German's defensive line and test their resolve. Were the German forces finally weakening? · Charge—9 March 1943: The 3rd Squadron of “Battle Group Strachwitz,” after taking fire from nearby Alexandrovka, was assigned the job of taking out the Soviet forces there. Rather than wait, they immediately charged down the slopes into the heavy defensive fire coming directly at them. · Can We Hold?—March 17 started out quietly, but it was not to stay that way. The II Battalion of the Grenadier Regiment was sent into Borisovka to free up other GD units for attacking elsewhere. The relieved units left mid-morning. In the late afternoon about a dozen Soviet tanks and infantry charged in from the northeast, broke through the outer line, and drove directly into the village. 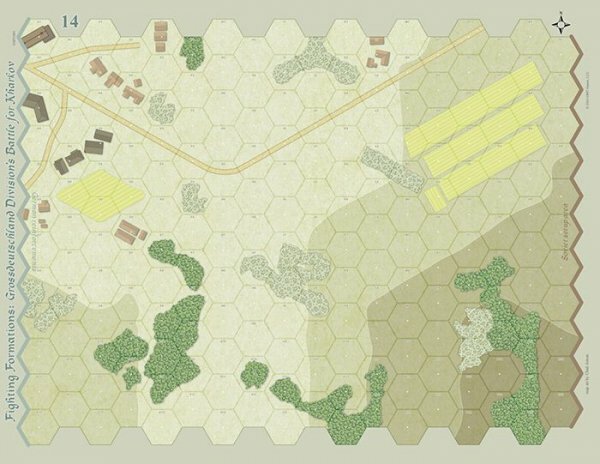 · Overrun—18 February 1943: Kharkov had just fallen to the Soviets and a realignment of the German defensive line was formed to its south. 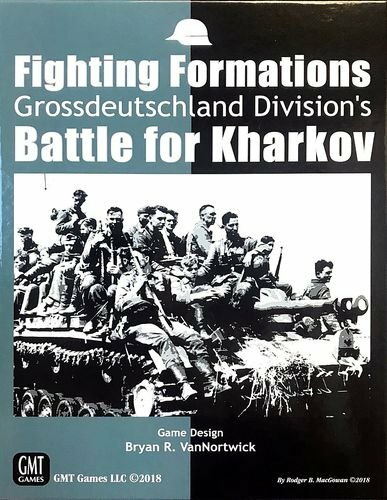 The Grossdeutschland Division's Fusilier Regiment was given the assignment of defending a section of road leading to the west out of Kharkov towards Ljubotin. Rybalko's Soviet 3rd Tank Army was trying to break through this new line southwest of the city. One of his attacks took place on the outskirts of the town of Korotich near a collective farm. · A Change of Orders—The Soviets 2nd Ukrainian Front launched a major offensive in late December of 1943 in southern Russia. The attacks began in earnest on 5 January 1944 with the goal of breaking through the German lines in the Kirovograd area. These caused multiple gaps in the German lines. On the evening of January 7 Grossdeutschland units were close at hand and were called upon to help remedy the tenuous situation. · Tigers—In early March ‘43 the momentum in the area around the city of Kharkov was turning towards the Germans. Manstein's counterattack was pushing the Soviets back and gaining ground on all sides. Gaps were developing between the Soviet 40th and 69th Armies. 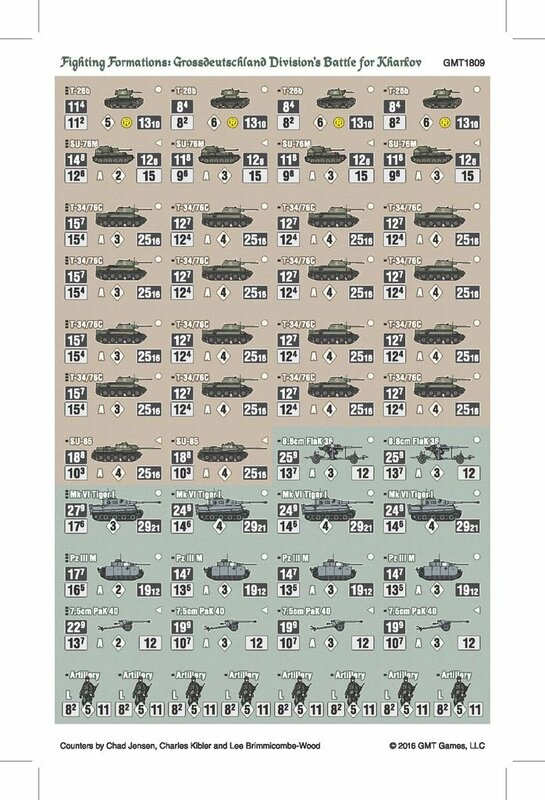 On March 4 Grossdeutschland Division received its first Tiger tank company. Three days later GD jumped off, attacking towards Bogodukhov to the northwest of Kharkov.